T he Kappa Chapter of Delta Kappa Epsilon was founded in 1852 at Miami University in Oxford, Ohio, as the twelfth chapter in the fraternity. 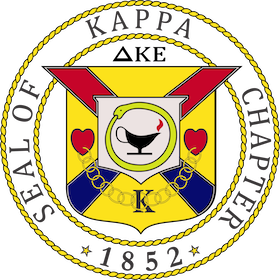 Throughout its history, the chapter has enjoyed as reputation as a premier fraternity on campus, known for both scholarship and its participation in the everyday life of the university. You will find information about the active chapter at Miami, an FAQ about rushing, joining, and living in the chapter house, and an area where friends and family of members can also be updated and ask questions via our forums. Please feel free to learn about our chapter and rush events, or to sign up for our site and enjoy access to the forums and our member’s areas. Sign up for our email list for potential members, and receive information about rushing Deke!